TheBlueGuerilla: Tory Party Rocked as Wrong Candidate Wins Primary. Tory Party Rocked as Wrong Candidate Wins Primary. 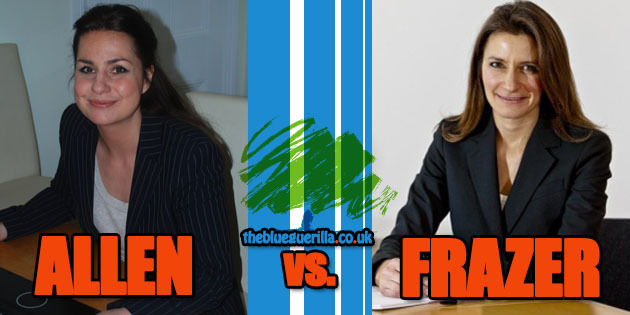 CAMBRIDGESHIRE CONSERVATIVES have been rocked and are set to hold an emergency meeting this Friday to decide if they incorrectly announced Lucy Frazer the winner of their open primary, TBG can reveal. Activists sensationally claim the ballots were tallied inaccurately and Ms Frazer was not the actual winner. Local Tories say that - "In the final round of voting between the pair, a pile of 25 votes was marked as being for Ms Frazer, when in fact only the top two papers were – with the rest being for Ms Allen." What's more, the alleged catastrophic error was discovered after an activist took the ballot papers home from the South-East Cambridgeshire primary and decided to recount them, according to reports. A letter to local party members from association chairman Brian Ashton, leaked to TBG, reads: "Although the original count took place in the normal way and was witnessed by others, during the following week unsubstantiated suggestions were made to officers that the ballot result announced at that meeting was incorrect." Friday’s crunch meeting is being seen as so vitally important that it will apparently be attended by the Tories' National Nominating Officer and Head of Candidates. Is it me or do they both look exactly the same ? ?